I have a configuration space as below with several obstacles. Green circles are all the points I need to go to. Blue line is the path returned from A* search. However, I am looking for path that's smoother and away from obstacles. what can I do? Suppose you are working in a 2D environment and that you have an obstacle of the size 2x2. When doing planning (graph search, etc. ), you increase the size of the obstacle to, for example, 3x3. Then when you find a path, the path is guaranteed to be at least of the distance 1 away from the actual obstacle. As for a smoother path, you may apply some shortcutting procedure on the path found by your path planner. Searching for shortcutting or trajectory shortcutting should give you a number of results. 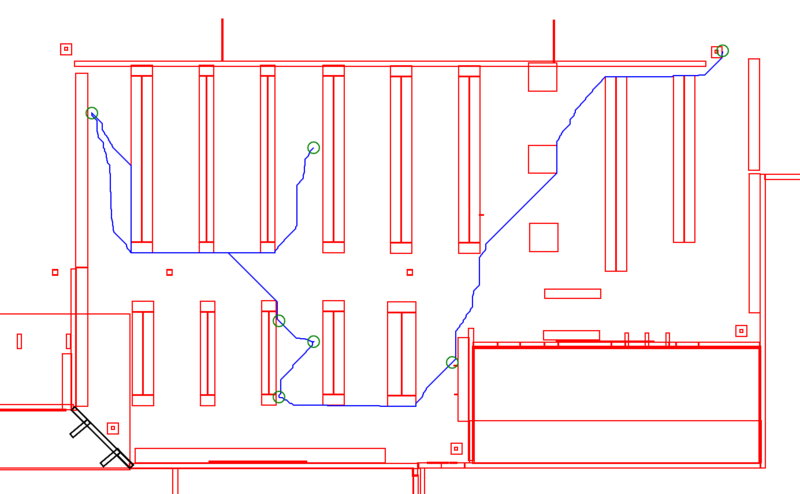 Most planning algorithms reduce your robot to a point and plan a path for that point. The arising problem is exaclty what you are facing. As suggested before, obstacle padding is one of the methods, but generally, the configuration space has been proposed to solve this problem. Configuration space is a more advanced and more general way of padding obstacles. The obstacles are enlarged by the dimentions of the robot, considering also the robot's orientation. A more detailed description can be found here. Smoothing will introduce slight deviations in the path, so make sure to consider possible collisions after smoothing also. Not the answer you're looking for? Browse other questions tagged motion-planning path-planning planning or ask your own question. Does RRT* guarantee asymptotic optimality for a minimum clearance cost metric? What's an efficient way to visit every reachable space on a grid with unknown obstacles? Difference between Single-Query and Multiple Query Algorithms?